What could Headwaters Junction do for the local economy in Northeast Indiana? 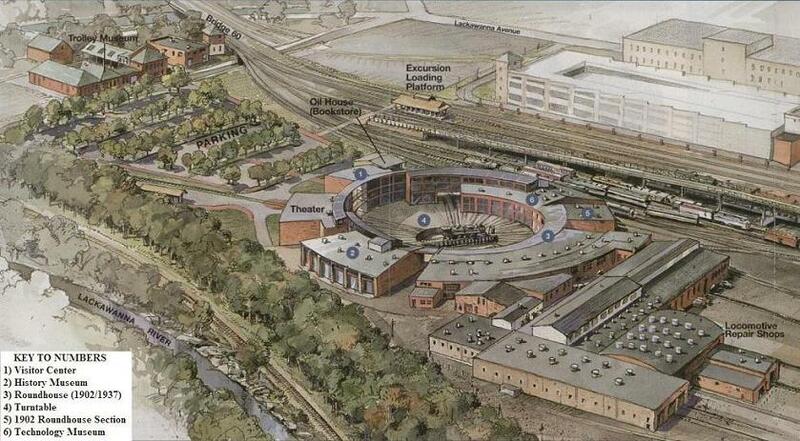 Steamtown in Scranton, Pennsylvania includes a rebuilt roundhouse, turntable, yard, interpretive display, and boarding site much like the proposed Headwaters Junction. Created as a National Park in 1986 to preserve an important railroad collection and restore a railroad yard, the development cost $8 million dollars when it was created. That’s the verdict of a new National Park Service (NPS) report, which shows that visitors to the Steamtown National Historic Site spent $4,377,400 in communities near the park last year, resulting in a cumulative benefit to the local economy of nearly $6 million. That spending by 84,257 visitors supported 72 jobs, according to NPS. Opened in 1995, Steamtown covers about 40 acres of the former Delaware, Lackawanna & Western Railroad yard in downtown Scranton. In addition to static exhibits, the museum offers rides on restored railroad equipment. Steamtown shares the yard with working freight trains, as well as with electric trolley cars that give rides for Lackawanna County’s Electric City Trolley Museum. The analysis was conducted by U.S. Geological Survey economists Catherine Cullinane Thomas and Christopher Huber and National Park Service economist Lynne Koontz. According to NPS, the report shows $15.7 billion of direct spending by 292.8 million park visitors in communities within 60 miles of a national park. That spending supported 277,000 jobs nationally; 235,600 of those jobs are found in these gateway communities. The cumulative benefit to the nation’s economy was $29.7 billion. How was that money spent? According to the 2014 report, the top purchases were lodging (30.6 percent), followed by food and beverages (20.3 percent), gas and oil (11.9 percent), admissions and fees (10.2 percent) and souvenirs and other expenses (9.9 percent). The numbers came as good news for Robert F. Durkin, President of the Greater Scranton Chamber of Commerce. “Steamtown National Historic Site – as indicated by these studies – brings a great deal of economic return to our region of northeastern Pennsylvania,” he said. That impact isn’t limited to Scranton, or Lackawanna County. Janet Hall, director of sales and marketing for the Greater Wilkes-Barre Chamber of Commerce, noted that “family-friendly” Steamtown, with its focus on the area’s rich railroad heritage, is an integral part of what draws tourists to Northeastern Pennsylvania. That makes Steamtown a key element in the region’s tourism industry, which brought $860 million in spending to Luzerne County in 2013, Hall said, citing a recently-released report commissioned for state tourism officials. The report also showed that Lackawanna County saw nearly $650 million worth of spending that same year.